Previously, we learned how to create a simple REST API in PHP. The create, read, update and delete database records (CRUD operations) has been useful for our projects. 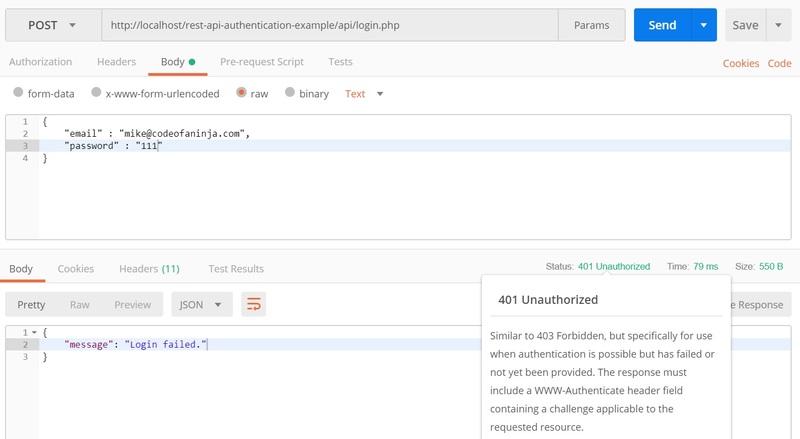 Today, we will learn how to authenticate a user using REST API and JSON Web Tokens or JWT. 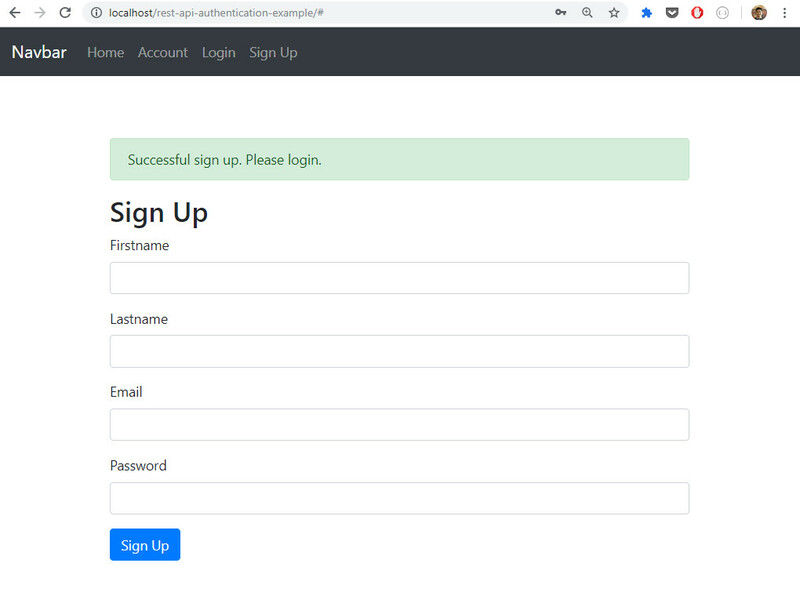 In this tutorial, we will cover a basic sign up or registration form, login and logout operations, updating a user account and more. 1.3 What does a JWT look like? In technical terms, JSON Web Token or JWT is an open standard (RFC 7519) that defines a compact and self-contained way for securely transmitting information between parties as a JSON object. This information can be verified and trusted because it is digitally signed. JWTs can be signed using a secret (with the HMAC algorithm) or a public/private key pair using RSA or ECDSA. For example, a server could generate a token that has the claim "logged in as admin" and provide that to a client. The client could then use that token to prove that it is logged in as admin. Please read more here, here, here and here. John (server) owns a house (protected data). Michael (client) wants to rent this house. John and Michael agreed to the house rules and they signed a contract (valid username and password). John gave Michael a key (token) with other related information (claims) so he has access to the house. Michael can now get inside or outside (HTTP requests) the house. It means an access was granted. If John (sever) and Michael (client) did not agree with the house rules, the contract won't be signed (invalid username and password) and John (server) won't give him a key (token). Even if Michael (client) has another type of key (token), he still won't have access to the house because it is a wrong key (token). It is not the key (token) John gave. It means access was denied. I've found another analogy that can be useful for you. Read it here. The video below might help explain the analogy. The following video about token-based authentication might help as well. A JSON Web Token or JWT looks like a string with three parts separated by dots. The following is an example of JWT. The header component contains information about how JWT signature should be computed. The payload component is the data that is stored inside the JWT. This can be user information like user ID, name and email. To create the signature component, you have to take the encoded header, the encoded payload, a secret, the algorithm specified in the header, and sign that. Read more here. In this tutorial, we won't have to worry about generating or encoding and decoding JWT because we will use a library called PHP-JWT. We explained JWT above. JWT is a token format and we can say it is a simple authentication protocol. OAuth is an authentication framework that can use JWT as a token. 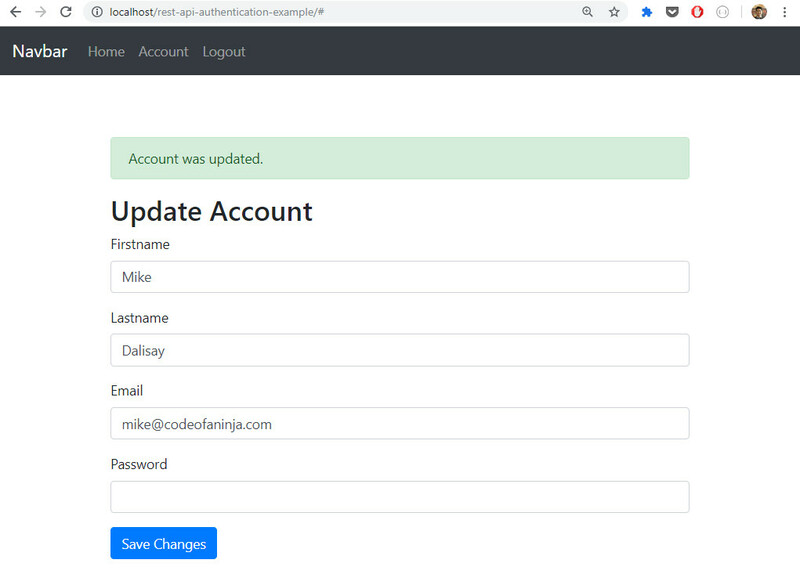 OAuth is used as a way for Internet users to grant websites or applications access to their information on other websites but without giving them the passwords. You have very simple use-case, like a single client application. Your users access their resources only through your own application. 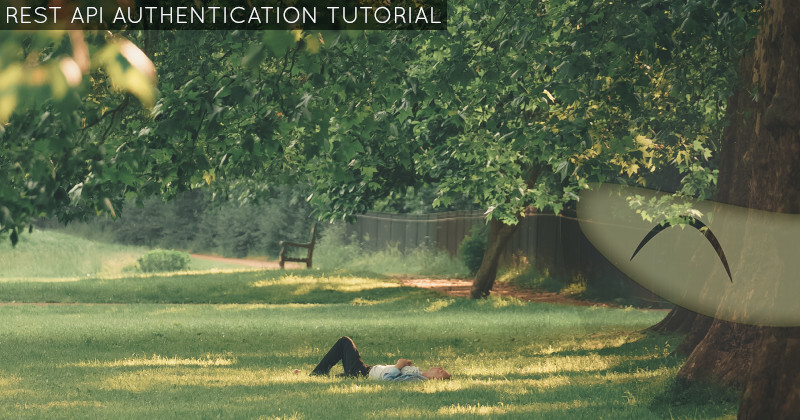 You want a quick-to-implement and simple stateless HTTP authentication to an API. Your users can access their resources through another application you don't own. You want to provide API to browser-based apps, native mobile apps or desktop apps. You want to use an Authentication Server that keeps track of tokens. It is important to visualize what we are trying to achieve in this tutorial. At the end of this tutorial, we will achieve the LEVEL 1 source code as seen on the screenshots below. Please click a photo below to enlarge and use the arrow icons to navigate the slideshow. Screenshots coming soon! See the list of features on section 14.2 below. The LEVEL 2 source code shows more amazing features that you can learn once you completed studying the LEVEL 1 source code. For now, let's proceed to the complete tutorial of our LEVEL 1 source code below. Let's code! At the end of this tutorial, we will have the following folders and files. ├─ rest-api-authentication-example/ - name of the project folder. ├─── api/ - main folder of the API. ├───────── core.php - file used for common settings or variables. ├───────── database.php - file used for connecting to the database. ├───────── php-jwt-master/ - folder of jwt library developed by Google. ├───────── user.php - class file that will handle the database queries. ├────── create_user.php - file that will process the input of from "sign up" form. 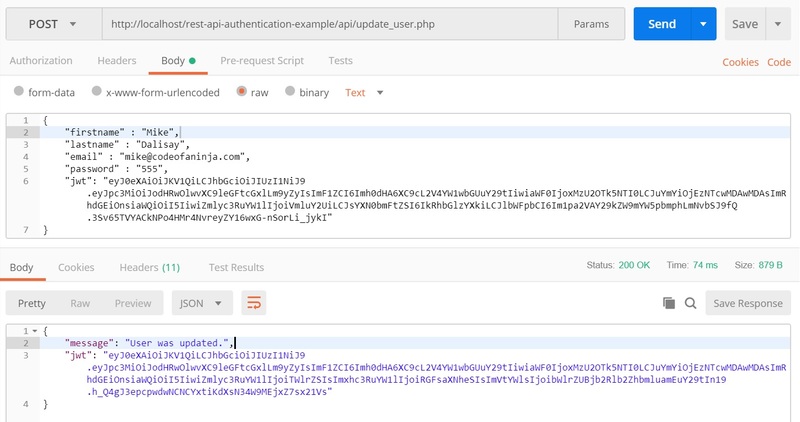 ├────── login.php - file that will encode and generate a JSON web token. ├────── update_user.php - file that will process the input of from "user account" form. 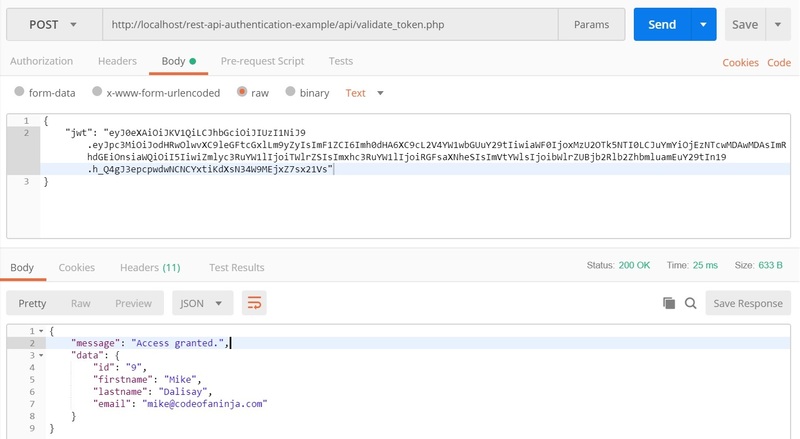 ├────── validate_token.php - file that will validate or decode the JSON web token. ├─── custom.css - contains any customization in the user interface. On the api_db database, create a new table called users. Put the following fields on the users table. 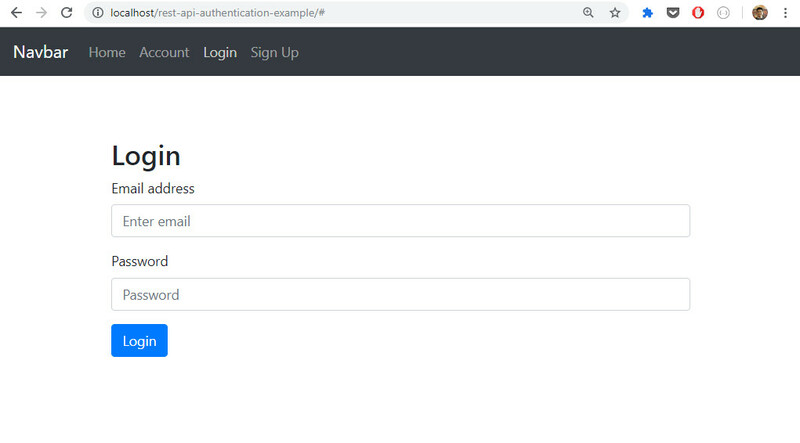 Create our main project folder and put rest-api-authentication-example as its name. If you're using XAMPP, you must create it inside the htdocs folder. In my case, I created it inside C:\xampp\htdocs directory. Open rest-api-authentication-example folder. Create api folder. Open api folder. Create config folder. Open config folder. Create a new file called database.php. Open rest-api-authentication-example folder. Create a folder called api. Open the api folder. Create a new file called create_user.php. We need to set headers on this new file so that it will only accept JSON data. Place the following code. We are saving the user information on a database so we need the database connection. We need to instantiate the user table as well because this will make the insert query later. Replace // database connection will be here comment of create_user.php file with the following code. We need to assign the submitted data on the object properties such as firstname, lastname, etc. Replace // submitted data will be here comment of create_user.php file with the following code. One the code below, we use the user object's create() method. It will tell the user if the user was created or not. Replace // use the create() method here comment of create_user.php file with the following code. The previous section will not work without the user object class. This is where we'll place all the user methods that contains database queries. If you're not familiar with private or public scopes, please learn from this resource. Open the api folder. Open objects folder. Create a new file called user.php. Place the following code. The code below shows the INSERT query, data sanitation and binding, and we used the built-in password_hash() method to secure the user's password on the database. If the execution is a success, the user information will be saved on the database. Replace the // create() method will be here comment of user.php file with the following code. $query = "INSERT INTO " . $this->table_name . " You need to use POSTMAN to test our API. Download your version of POSTMAN here. First, we will test for successful creation of a user. Launch POSTMAN. To test for a failed creation of a user, just remove the value of the password above and click the blue "Send" button. On the code below, we set the file headers so that it will know where the request should come from and what type of data is accepted. Open Create a new file called login.php. Place the following code. We will compare the user email and password from the database so we need the database connection. We need to instantiate the user table as well because this will allow us to verify if the email exists and read the hashed password. 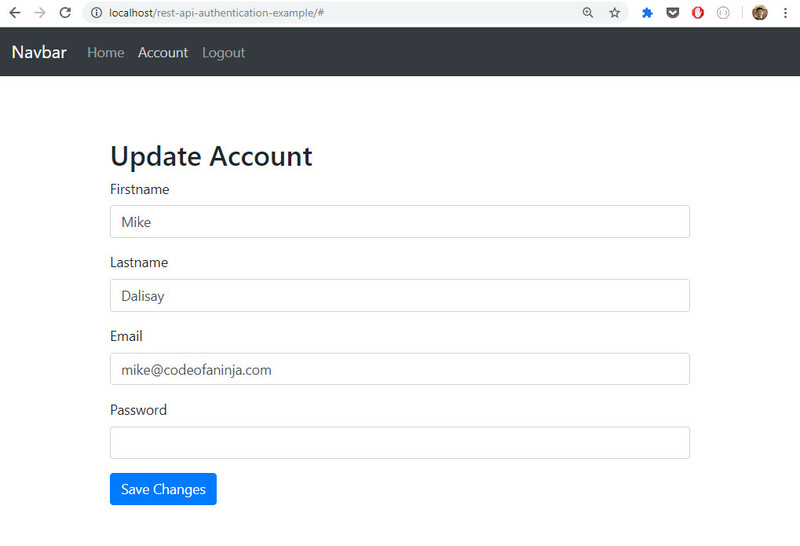 Replace // database connection will be here comment of login.php file with the following code. On the code below, we get the email submitted by the user through the login form. We check if the email exists on our database. Replace // check email existence here comment of login.php file with the following code. We will add an emailExists() method on our user object class. This method will return true if the submitted email exists, else it will return false. Replace // emailExists() method will be here comment of /api/objects/user.php file with the following code. FROM " . $this->table_name . " The code below shows the necessary files we needed to include to generate or encode a JSON web token. Replace // files for jwt will be here comment of login.php file with the following code. The code below will check if email exists and if password match what is in the database. We used the built-in password_verify() function to do the matching. 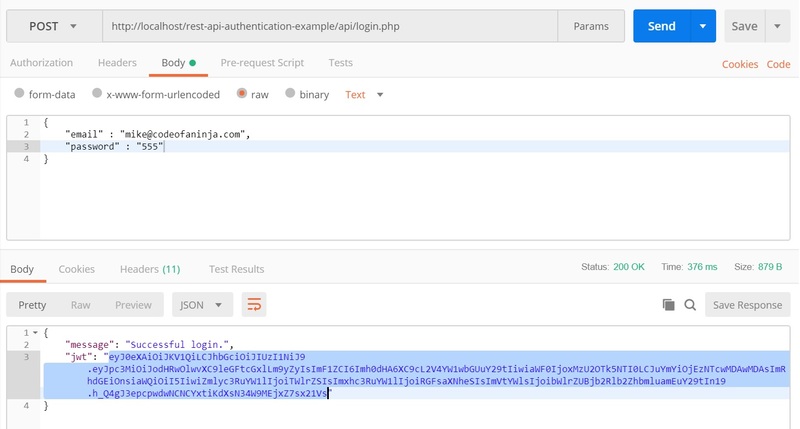 If login is valid, it will generate the JSON Web Token. Replace // generate jwt will be here comment of login.php file with the following code. If the email does not exist or the password did not match, tell the user he cannot login. Replace // login failed will be here comment of login.php file with the following code. The login.php file will not work without the core.php file. This file contains common settings or variables of our application. We have variables used by our JWT library to encode and decode a token. $key's value must be your own and unique secret key. The rest is called the registered claim names. The iss (issuer) claim identifies the principal that issued the JWT. The aud (audience) claim identifies the recipients that the JWT is intended for. The iat (issued at) claim identifies the time at which the JWT was issued. The nbf (not before) claim identifies the time before which the JWT MUST NOT be accepted for processing. You can use another useful claim name called exp (expiration time) which identifies the expiration time on or after which the JWT MUST NOT be accepted for processing. Including these claims are optional. Please read more about registered claim names here. Open the api folder. Open the config folder. Create a new file called core.php. Place the following code. The files included in login.php file will not work without this library. Download the library from this link. Create libs folder. Unzip the downloaded library there. See the file structure above to see how it should look like. To test for successful login, enter the following as the request URL. Enter the following on the body. We need to take note of the generated JWT because we will use it to access a resource later. 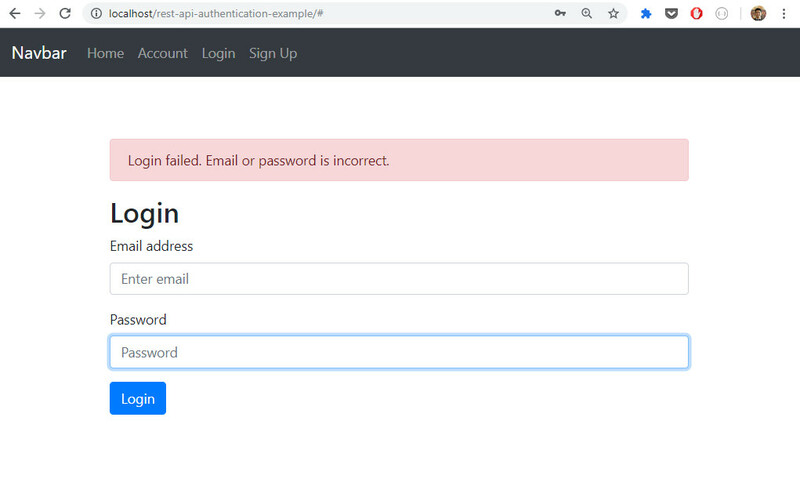 To test for failed login, change the value of the password to 111 because it is a wrong password. This file will return an output in JSON format and will accept requests from specified URL. We'll set the correct headers. Open api folder. Create validate_token.php file. Place the following code. The code below shows the inclusion of the necessary files to decode the given JSON web token. Replace // files for decoding jwt will be here comment of validate_token.php file with the following code. The code below shows how to get the value of JSON web token. Replace // retrieve gieve jwt here comment of validate_token.php file with the following code. Check if a JWT is given. If true, decode it. Return a response code of 200, tell the user access is granted and some user information. Replace // decode jwt here comment of validate_token.php file with the following code. If decoding JWT failed, it means the access to the resource is denied. We need to return a response code of 401, tell the user access is denied and some information about the error. Replace // catch will be here comment of validate_token.php file with the following code. If JWT is empty, it means access is also denied. We need to return a response code of 401 and tell the user access is denied. Replace // error if jwt is empty will be here comment of validate_token.php file with the following code. To test for successful access, enter the following request URL. Enter the JSON Web Token we retrieved earlier. The JSON web token below is different from yours. Make sure your JWT was generated in your machine. It should look like this on POSTMAN. To test for failed access, just put a word "EDITED" on your JWT. This will make JWT wrong. It will result in a denied access. It should look like this. Open api folder. Create update_user.php file. Place the following code. Replace // files for decoding jwt will be here comment of update_user.php file with the following code. We will need to update user information on the database. That's why we need to get a database connection. Replace // database connection will be here comment of update_user.php file with the following code. The code below shows how to get the value of given JSON web token. Replace // retrieve given jwt here comment of update_user.php file with the following code. Check if a JWT is given. If true, decode it inside a try block. Replace // decode jwt here comment of update_user.php file with the following code. If decoding JWT fails, we need to set a response code of 401, tell the user access is denied and show information about the error. Replace // catch failed decoding will be here comment of update_user.php file with the following code. We need to set the submitted data (through the HTML form) to the user object properties. Replace // set user property values here comment of update_user.php file with the following code. One the code below, we use the user object's create() method. If it returns true, it means user was updated. If it returns false, the system is unable to update the user information. Replace // update user will be here comment of update_user.php file with the following code. The code below shows the UPDATE query, data sanitation and binding. 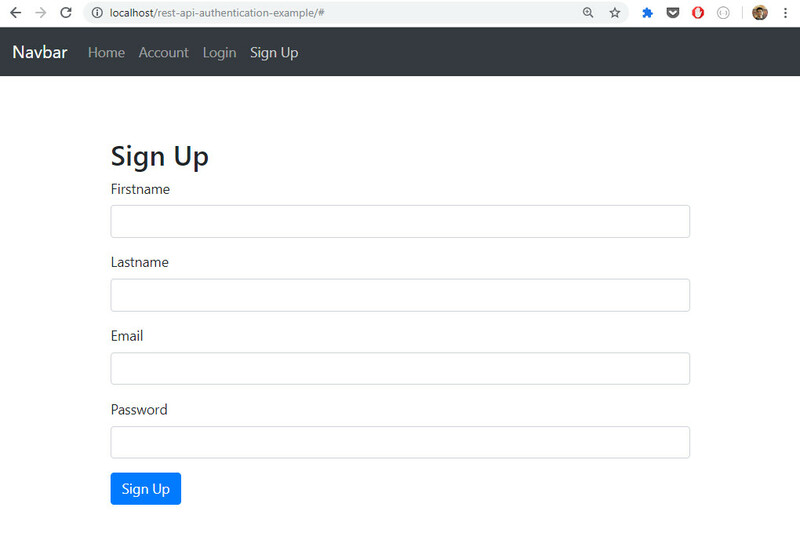 If a password was typed in the HTML form, we use the built-in password_hash() method to secure the user's password on the database. If the execution is a success, the user information will be updated on the database. Replace the // update() method will be here comment of api/objects/user.php file with the following code. $query = "UPDATE " . $this->table_name . " We need to re-generate or get a new JSON Web Token especially if a user information was changed. The code below does that and it sets a response code of 200 and tell the user that the information was updated. Replace the // regenerate jwt will be here comment of update_user.php file with the following code. We need to tell the user that access is denied if JWT does not exist. We set a response code of 401 as well. Replace the // error message if jwt is empty will be here comment of update_user.php file with the following code. To test for successful user update, enter the following as request URL on POSTMAN. On the body section, enter new user information with the JSON Web Token we retrieved earlier. The JSON web token below is different from yours. Make sure your JWT was generated in your machine. As you can see on the image above, it generates a new JWT and it will be stored in the client application. We can use the new information on the app interface later. To test for failed user update, you can just add the word EDITED on the submitted JWT or just remove the JWT. It should look like the following. All of the essential codes will be in this single index.html file. Open rest-api-authentication-example folder. Create index.html file. Place the following code. The navigation bar is where the menus like home page, account page, login page, logout and sign up page can be clicked or triggered. Replace the <!-- navigation bar will be here --> comment of index.html file with the following code. The content section is where the contents like HTML forms and message prompts will be rendered. Replace the <!-- content section will be here --> comment of index.html file with the following code. We are using Bootstrap 4 to make the user interface look good. We will use the CDN link so that we won't have to download the whole library. We will see the use of custom CSS file on the next section. Replace the <!-- CSS links will be here --> comment of index.html file with the following code. We use the custom CSS for any look & feel customization we want to implement. Open rest-api-authentication-example folder. Create custom.css file. Place the following code. In this tutorial, we use the jQuery library to render the interface and make HTTP requests. Replace the <!-- script links will be here --> comment of index.html file with the following code. When you click the Sign Up menu on the navigation bar, it will show a sign up or registration form. The code below shows the click trigger and the HTML form. Replace the <!-- jquery scripts will be here --> comment of index.html file with the following code. We need to process the form data when it is submitted. Replace the trigger when registration form is submitted here comment of index.html file with the following code. The clearResponse() method was used on the previous section. Its only purpose is to remove any prompt messages that may have been displayed on the screen. Replace the // clearResponse() will be here comment of index.html file with the following code. When user click the Sign Up link on the navigation bar. After the user filled out and submitted the form. 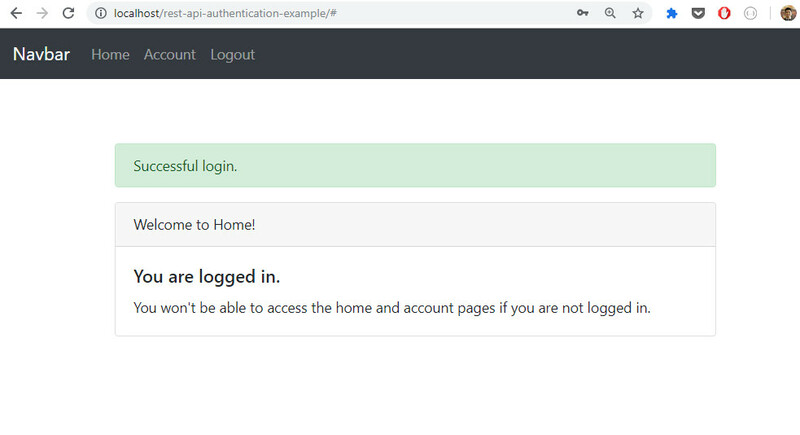 When you click the Login menu on the navigation bar, it will show a login form. The code below shows the click trigger and showLoginPage(); function to show a login form. Replace the // show login form trigger will be here comment of index.html file with the following code. The function below shows the HTML form for users to login. Replace the // showLoginPage() will be here comment of index.html file with the following code. The setCookie() function will help us store JWT on the cookie. Replace the // setCookie() will be here comment of index.html file with the following code. The showLoggedOutMenu() function was used in the previous section. This function will make the menu look like the options for a logged-out user. Replace the // showLoggedOutMenu() will be here comment of index.html file with the following code. The code below shows a submit trigger for the login form. It gets the data from the form and store it in the form_data variable. Replace the // login form submit trigger will be here comment of index.html file with the following code. The serializeObject function will convert form data to JSON format. We need this function to send values from an HTML form to the API. Replace the // serializeObject will be here comment of index.html file with the following code. The code below shows how we make an HTTP request, specifically an AJAX request to verify if the submitted email and password is valid. 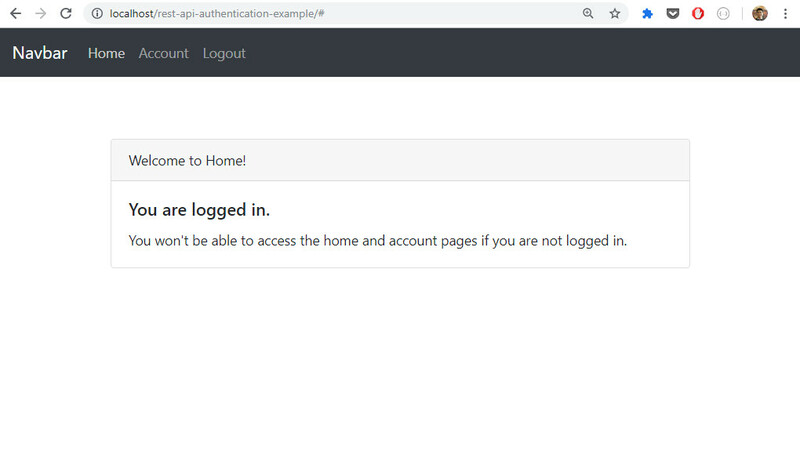 If it is valid, we will save the JWT to localStorage, show the home page and tell the user it was a successful login. Replace the // http request will be here comment of index.html file with the following code. If the submitted email and password is invalide, we tell the user login failed and empty the login form. Replace the // error response will be here comment of index.html file with the following code. If the user clicks the Login menu on the navigation bar. If the user entered an invalid email or password. If the user entered a valid email and password. The code below shows a click trigger with showHomePage(); function. Replace the // trigger to show home page will be here comment of index.html file with the following code. On the showHomePage() function, we need to validate the stored JWT before showing the home page HTML. Replace the // showHomePage() function will be here comment of index.html file with the following code. The getCookie() function will help us read the JWT we stored earlier. Replace the // getCookie() will be here comment of index.html file with the following code. If JWT is valid, we show the home page HTML and call the showLoggedInMenu() function. Replace the // home page html will be here comment of index.html file with the following code. The showLoggedInMenu() function will change the menu options to look like a menu for a logged-in user. Replace the showLoggedInMenu() will be here comment of index.html file with the following code. If JWT is invalid, we will show the login page and ask the user to login. Replace the // show login page on error will be here comment of index.html file with the following code. If a logged-out user clicked the Home menu on the navigation bar. If a logged-in user clicked the Home menu on the navigation bar. The code below shows a click trigger with showUpdateAccountForm(); function. Replace the // trigger to show account form will be here comment of index.html file with the following code. 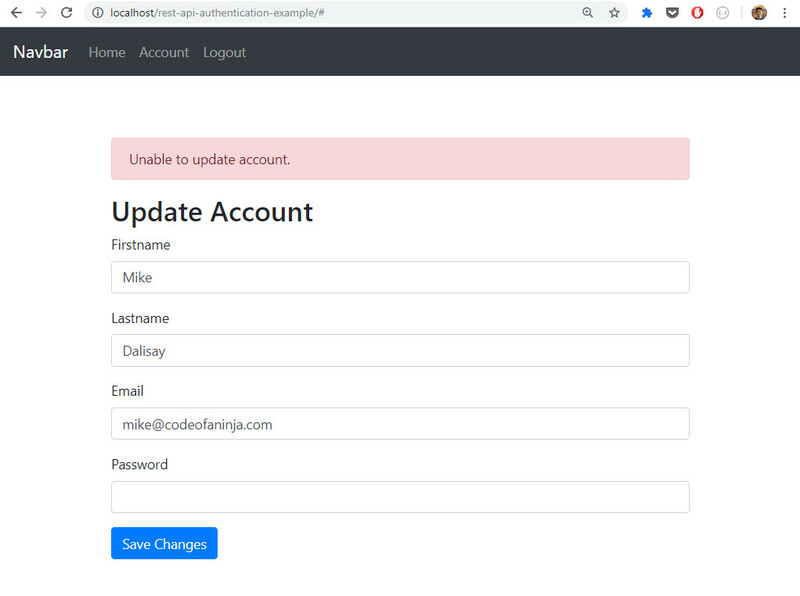 We need the showUpdateAccountForm() function to render to HTML form for updating a user account. First, we need to verify if JWT is valid. We use the getCookie('jwt'); function to get the JWT and send it to validate_token.php via jQuery $.post method. Replace the // showUpdateAccountForm() will be here comment of index.html file with the following code. If JWT is valid, we will show the HTML form using the code below. Replace the // html form for updating user account will be here comment of index.html file with the following code. If JWT is invalid, we will logout the user and ask him to login. Replace the // error message when jwt is invalid will be here comment of index.html file with the following code. If the submit button was clicked, we will use the code below to catch that trigger. We will get the form handle and JWT as well. Replace the // trigger for updating user account will be here comment of index.html file with the following code. On the code below, we get the form values and add the JWT to it. We convert the form values to JSON via stringify() function so that it can be sent to the API. Replace the // get form data and jwt here comment of index.html file with the following code. We send the form values to update_user.php using jQuery AJAX method. If the response is successful, we tell the user his account was updated. We store the new JWT to localStorage as well. Replace the // send data to api here comment of index.html file with the following code. If the system is unable to update the user, we tell the user about that. 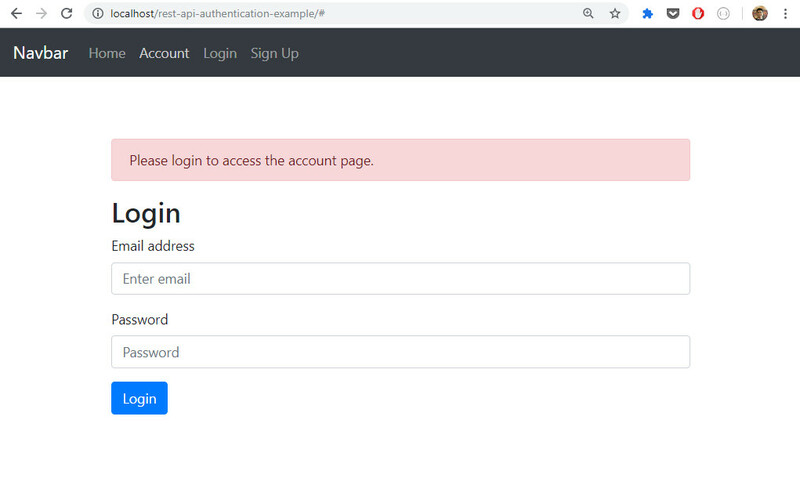 If JWT is invalid and access is denied, we logout the user and ask him to login. Replace the // errors will be handled here comment of index.html file with the following code. If user account was updated successfully. If there was a problem when updating user account. The click trigger below is used when the user click the Logout link on the menu. We use the showLoginPage(); method to logout the user. We tell he is logged out as well. Replace the // trigger to logout will be here comment of index.html file with the following code. If the user clicked the Logout link on the menu. But we believe you will learn faster if you’ll see the final source code as well. We consider it as your additional guide. Imagine the value or skill upgrade it can bring you. The additional income you can get from your work, projects or business. The precious time you save. Isn’t that what you want? We will learn how to create, read, update and delete database records (with user interface) on our jQuery AJAX CRUD Tutorial. If you want to receive new and updated high-quality tutorials, please subscribe for free. Please note that this post is not yet in its final form. We are going to update this post so it will be perfect in the future. 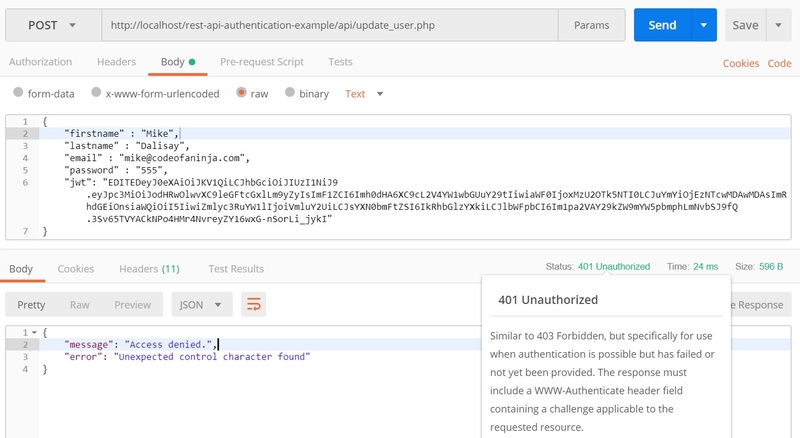 If you have a friend or know someone who needs this REST API Authentication Example in PHP & JWT, please share this page to them! I know you will help them a lot by doing it. Thanks! We are unable to replicate the issue. It works on our end. Would send a screenshot of the error message you encountered? Hi @dannchristian:disqus, I updated the tutorial with section 9.3 and 10.5. Please follow the additional sections. Please add the code from section 9.7 in that case. Hi @margandavor:disqus, I updated the tutorial with section 9.3, 9.7 and 10.5. I suggest following the tutorial with the new sections. Hi @disqus_B3RJLIpPZj:disqus , thanks for the kind words! Your question makes sense so I added section 1.4 above to shed some light into this. Please follow section 9.8 for that. Thank you! I’m unable to replicate the issue. Did you see any errors on the console? I still can’t replicate this issue. I won’t be able to solve it because I can’t see any error message to solve. Hi @disqus_8BJXiwIHLL:disqus, you’re welcome and thanks for your concern. You’re right, I got the wrong reference the first time. I updated the tutorial above and I’m now using a cookie to store the JWT. I need to update it again in the future for CSRF attack protection. For now, I believe our tutorial above is still a good reference for basic understanding of how JWT works. Hi @disqus_i0FJTz5h4J:disqus, in that case, you need to verify if $this->password has value. You can add this code before the // sanitize comment on section 5.6 above.